Robert Reich on the 7 biggest lies on taxes, the economy and more. Below is an expansion of what Robert Reich so effectively stated and illustrated in an amazing 2 minutes. This is one of the staples of the Republican parties. Their claim is that cutting taxes on the rich (and for that matter, corporations) will free up capital that will magically find its way back into the economy in the form of investment and hiring. Aside from being demonstrably false (see charts below), it also makes the false assumption that tax rates are what drive or divert hiring and other investments. In reality, more important market signals like demand are what drive these, regardless of tax rates. Cutting taxes on the rich and corporations has done nothing to boost GDP growth. 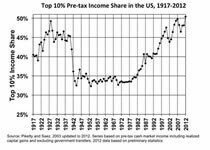 Rather, the added streams of revenue have simply increased profits and increased wealth disparity here in the US. The middle class we we know/knew it was created during a time of higher tax rates on the rich and has largely disappeared with lowered tax rates. 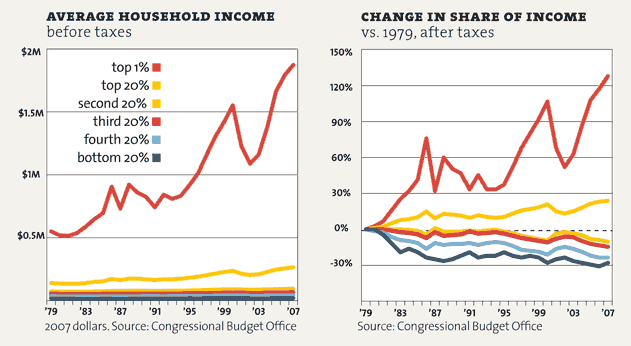 There exists a correlation between tax cuts on the rich and a growing wealth disparity. 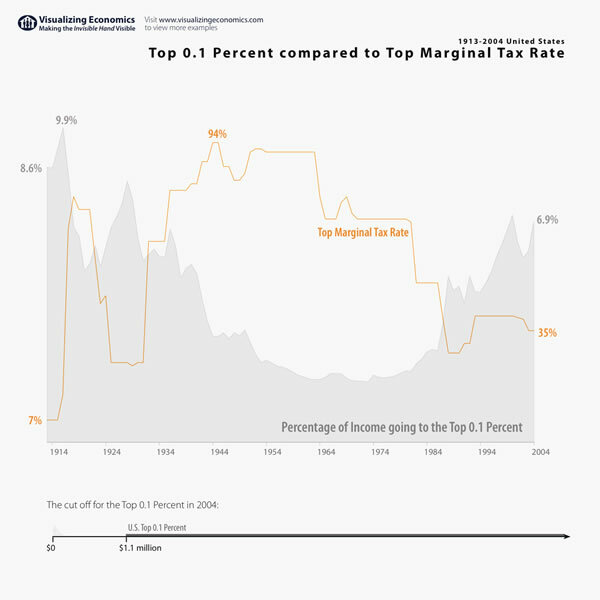 Reducing the top marginal income tax rates (along with capital gains taxes) has led to more coagulation of wealth at the top. 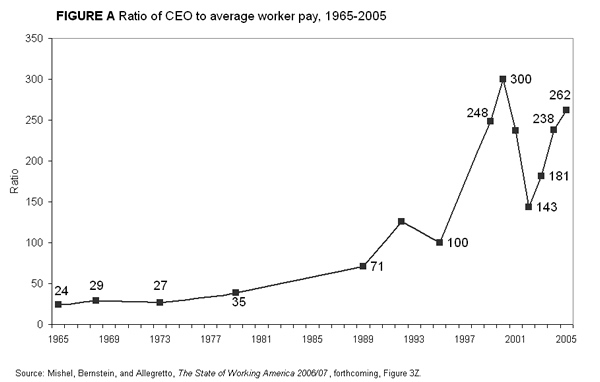 The ratio of CEO-to-worker pay is off the charts. 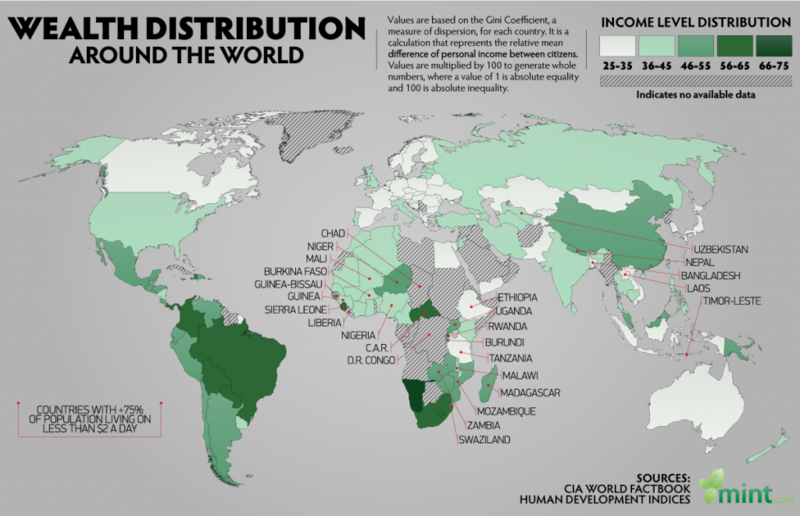 Among advanced countries, this disparity in wealth is largely specific to the United States. 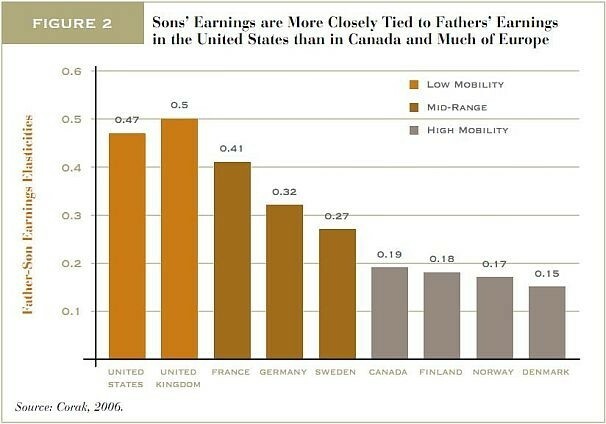 In addition, economic mobility is greater in countries with higher taxes on the rich. The non-correlation between tax cuts on the rich and GDP growth. Is High Inequality Offset by Mobility? Lowering Corporate taxes has led to higher corporate profits. Lowering Corporate taxes has also led to a a higher burden on the individual income and payroll tax (which largely affects the middle class and the poor). A cross-country comparison refutes this bad argument. The nations with larger governments have healthier economies. Those with small governments have rampant poverty and unemployment. Republicans mistakenly think that commerce is created in a vacuum without safe public roads, breathable air, law enforcement, national security, enforces property rights, etc, and that government flies in from afar to collect taxes. The budget deficit is the gap between federal revenues and federal spending. The longer we stay in this economic downturn, the longer federal revenues remain suppressed (because people aren’t working and consuming). The sooner we’re out of this, and more people are working and spending, the faster federal revenues will climb to help close this gap. In other word, federal spending (like a stimulus package) acts as an investment. Republicans want to make it sound like money being thrown away at happy hour. Lowered revenues from Bush tax cuts and recent economic downturn have contributed more to our deficit than anything else. Health Care costs overall have risen. Whereas private insurance companies react by raising premiums and deductibles or outright refusing coverage to high-risk individuals, Medicare and Medicaid simply absorb these costs. Aside from the fact that neither of these programs turn down patients due to pre-existing conditions, they also cover the most expensive to treat (the poor and the elderly). A dollar spent on Medicare means more money going into actual treatment and less money into administrative costs (ie. checking patient backgrounds for pre-existing conditions, back-and-forth paperwork between doctors and insurance companies, advertising, lobbying Congress to not pass meaningful health reform, etc). When you hear about “runaway Medicare spending,” it’s really “runaway Health care costs.” In fact, according to the National Health Expenditure Reporprivate sector health care costs have risen faster than Medicare/Medicaid (“socialized medicine”) costs (Read the entire PDF here). according to the National Health Expenditure Report, private health insurance costs have risen at a faster rate than public health insurance (ie. Medicare, Medicaid). A Ponzi Scheme works by tricking investors into investing into what they are tricked into believing are lucrative markets/activities when in fact, these returns are only made from recruiting new investors into doing the same and using that money to fund these lucrative returns. There is nothing hidden about Social Security, which simply acts as a sort of retirement insurance that everyone pays into and receives a form of retirement from eventually. There exists a legacy cost due to a back payment. When the program started, it funded retirement for people who were retiring within a couple of years, which means those people had no time to pay a lifetime of work to fund this retirement. Their retirements were funded by the existing young workforce, and so their exists a legacy cost (many advocates of privatizing social security costs factor in this added cost into social security when arguing that SS yields lower returns than their preferred privatized counterpart where they conveniently avoid factoring in this legacy costs). The idea that social security is bankrupt and there is nothing that can be done is nonsense. 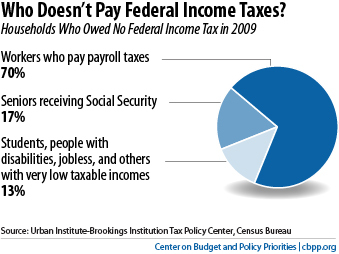 Social Security is funded by the payroll tax. The Social Security portion taxes about 12% of the first $106K earned. Which means someone earning an income of $212K/year is paying 6% of their income into social security (because they’re only paying the first half of their income into SS) and someone earning a salary of $106 million is paying 1.2 % of their income into social security (because they’re only paying the first tenth of their income into SS). Raising this rate the Social Security tax beyond the first $106K will solve this problem. It’s important to note that someone earning $30K/year also pays 12% of their check ($3,600) into the SS portion of the payroll tax. By focusing solely on income taxes, many mistakenly argue that around half of the working population pays “no taxes.” This doesn’t take into account the payroll tax which takes up roughly 15% of everyone’s paycheck. What’s more, is this percentage drops after $106K, because the Social Security portion taxes 12.4% of the first $106K, which means those making more than this amount are taxed at a lower rate. The Medicare portion taxes 2.9% regardless of earnings (these rates have temporarily changed due to tax cuts, but you can see the 2010 and 2011 payroll tax rates here (pdf)). So the more someone earns after 106K, the lower they are taxed as a percentage. In addition to this, there are sales taxes (a sales tax of 7% is more significant to someone earning $30k/year compared to someone earning $300k or for that matter, $3 billion/year) and whatever state taxes apply. 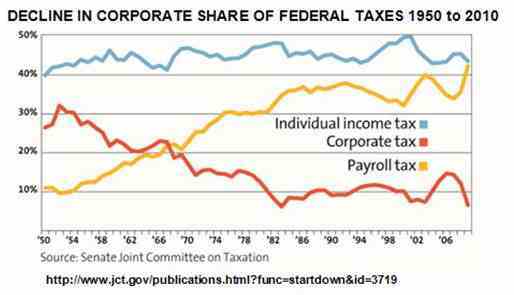 As you can see, as taxes on corporations and income taxes on the top earners have been lowered, the payroll tax has become a more significant share of federal revenue. Obama’s Stimulus Package – Did it Fail?